Perhaps on of the saddest tales in all of the South is the story of Mary the Elephant. Mary was a circus elephant in 1916 with Sparks Brother's Circus. The Circus had hired a drifter by the name of "Red" that day to be Mary's handler. During the pre-circus parade in Kinsport, TN Red smacked Mary with his bull hook. Mary responded by wrapping her trunk around Red and threw him to the ground. She then took her foot placed it on Red's head and squished it like a grape. It is reported that local children were traumatized for life. But the show must go on: Mary performed in the circus as normal. Unfortunately for Mary, the people of Kingsport were enraged that an Elephant straight up murdered a man in front of their children. To answer their concerns the Ringmaster announced that the following show in Erwin, TN would also feature a public execution of the murderous elephant. The deed was carried out in Erwin, TN. A railroad wench was used to hang Mary by the neck. The chain snapped the first go around and Mary crashed to the ground, still alive. Of course this would not deter the circus, they rehung Mary by the neck until she died. She was then dumped in an unmarked grade and the circus left Erwin, TN. It is reported that local children were traumatized for life. A single picture of the execution was taken on that day. Some people find this image incredibly disturbing, so be warned. You can see it HERE. 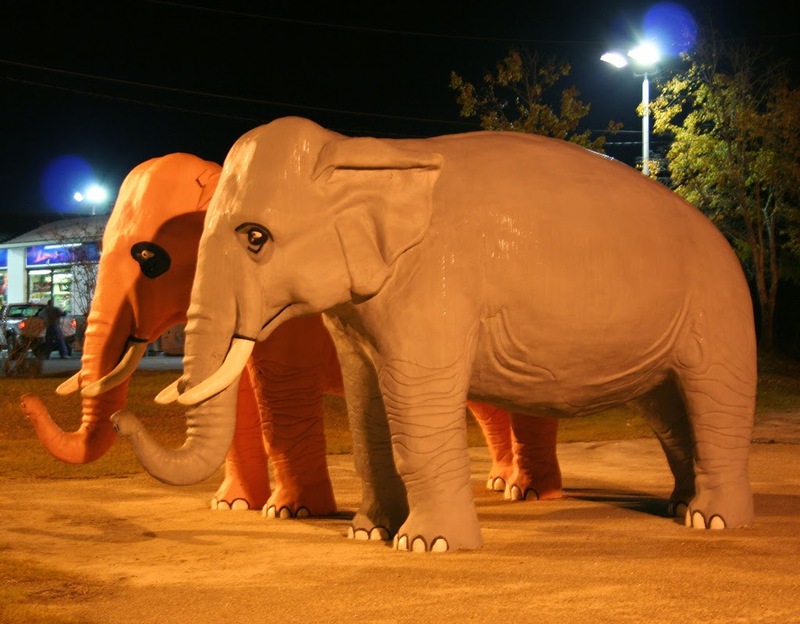 It is said that the people of Erwin are not proud of their legacy as "The Town that Hung an Elephant" and that the subject is somewhat taboo. 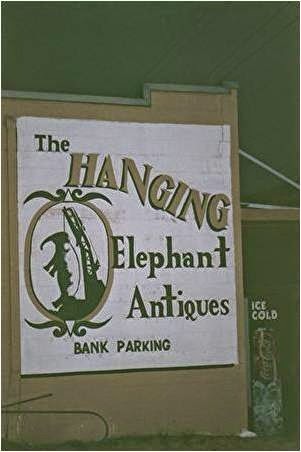 However, There was one business who wasn't afraid to capitalize on the legacy: Hanging Elephant Antiques. They were not subtle about it either, as they used the infamous image of Mary hanging as their logo. 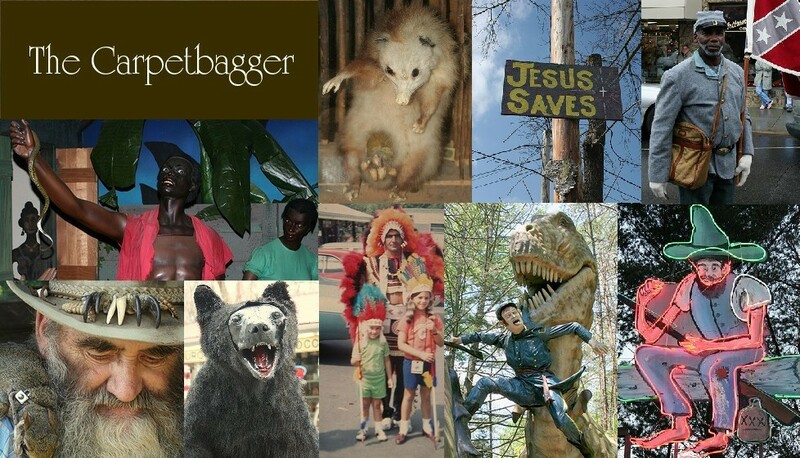 Here is an old picture of their logo I found on the internet. I have been absolutely fascinated by this Macabre tale ever since I heard it. When I finally had an opportunity to visit Erwin, TN. I wanted to find out all I could about Mary. On a small side note, Erwin, TN sits in the stretch of Mountains that straddles the NC and TN state line. This stretch of mostly unpopulated land was actually its own state at one point. This state was known as "Franklin". There are small reminders here and there that pay homage to the lost state of Franklin. So anyways, upon arriving in Erwin. I went to the only logical place I could think of to find out info on Mary the Elephant: Hanging Elephant Antiques. Unfortunately, the shop no longer existed. Its logo had been removed and covered up with this. 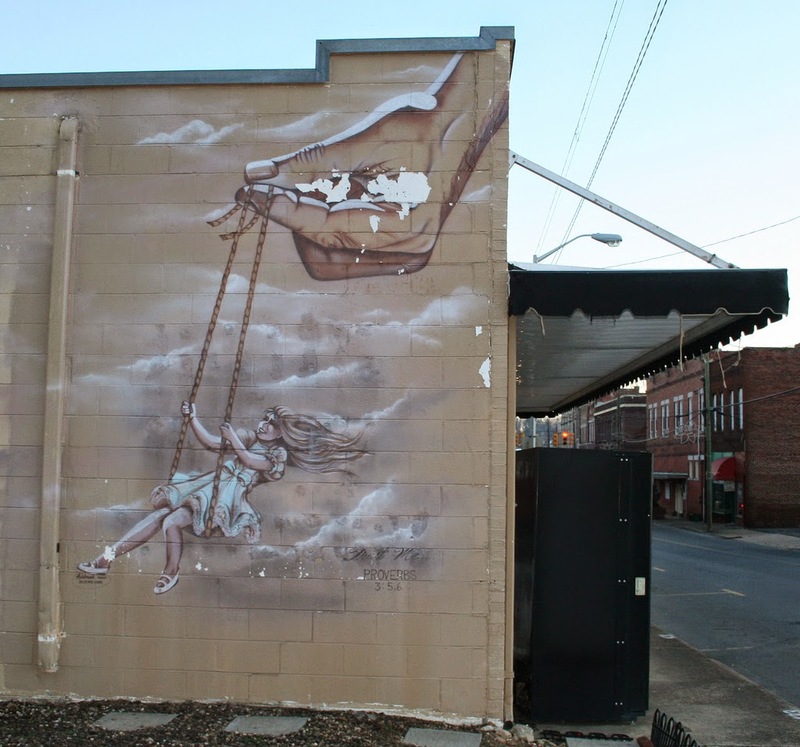 The haunting image of and Elephant swinging by its neck was gone and replaced with image of a little girl swinging from God's finger tips. But I was not ready to give up. Some quick research showed that there is a local history museum in town. So off to the Unicoi County Heritage Museum I went. The museum was curated by an older lady. She was extremely friendly and eager to talk to me about the local history. Oddly enough, even though the museum was much larger then most local museums of its type, it didn't make a single mention of its most famous scandal. The curator never mentioned anything about Mary either and I was a little nervous about bringing it up. The lady shadowed me through the museum, which actually had one of the best collections of unintentionally creepy mannequins I have ever seen. I finally worked up the nerve to ask the lady about Mary. She waved her hand in the air and sighed. Obviously she was tired of people asking about the elephant. "It was a mercy killing," she said, and just as quickly she moved onto the next exhibit without another word about Mary. 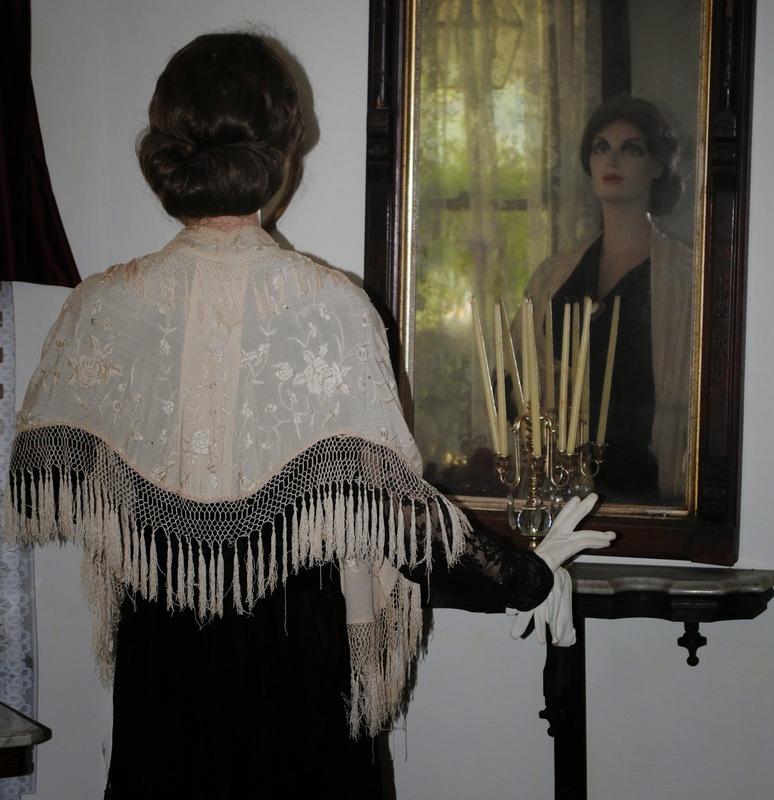 She showed me the only part of the museum she didn't like: The Taxidermy room. Personally, I rather enjoyed it. The lady was even kind enough to open up the railroad museum in the back that was not yet open to the public and showed me around. As we left the Railroad Museum, I had finally worked up the courage to bring up Mary again. "Early, you said that Elephant hanging was a mercy killing." "Yes," she said. Then suddenly she waved at someone off in the distant and walked off leaving me standing there by myself.